The Mangalica pig is an ancient Hungarian pig breed with a stiff woolly coat, just like a sheep. The pig is totally unsuitable for breeding in a stable and is perfectly equipped to live outside even in inclement weather. It is a slow-growing variety, with a firm layer of fat. It has been scientifically proven (Debrecen University, Hungary) that this layer of fat contains many unsaturated fatty acids. The Omega3 content is 2 to 3 times higher than fish. A pure natural product, full of flavor and super tender. Pork for foodies! 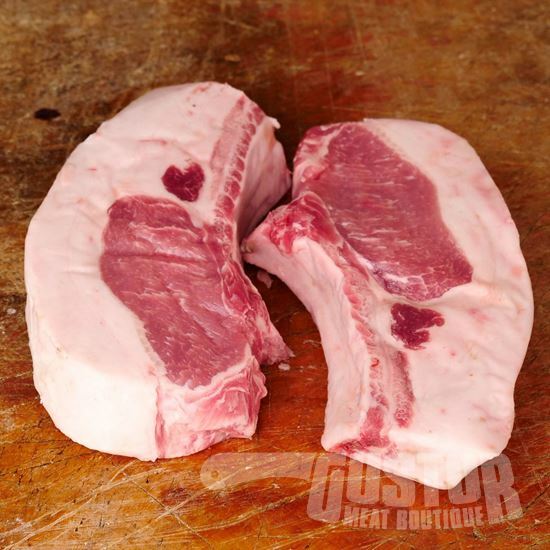 Gustor offers you the cutlets (pack of 2) and also a unique Roast boneless from the neck. Given the very irregular supply, this product will be delivered frozen.